Have you ever tried sweet almond oil? If you don't know it yet, the oil derived from the almond tree is good for both skin and hair. Sweet almond oil is laden with nutrients and vitamins A, D, and E, it is an excellent carrier oil and can be found in many skin and body care products. Almond trees have been in existence since a long timeand there are two kinds of trees. One tree produces pink flowers with bitter oil extracted from the nut kernels. The oil is used to make liquor and oil for household uses. 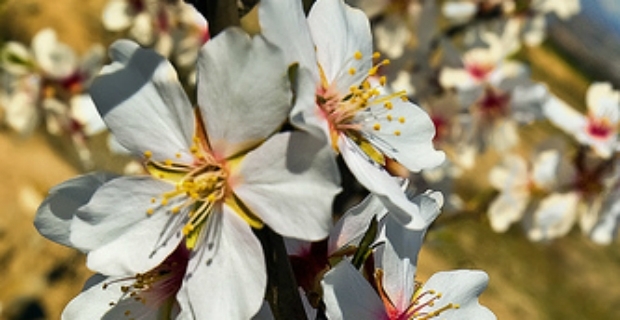 The other type of almond tree bears white flowers and oil derived from the nut is used to make sweet almond oil, a carrier for skin care lotions, oils, and creams. Skin, hair, and body care products containing sweet almond oil is highly valued because of several benefits. 1. Source of nourishment for the skin and hair - It is rich in vitamins A, D, and E providing the skin with proper nutrients. 2. A good emollient – The richness of the oil provides relief for dry skin and lips. In addition, it is not thick in consistency making it easy to absorb on the skin. 3. Minimises hair loss – Those who shed a lot of hair can benefit from using sweet almond oil. Although it is normal to lose a couple of hair strands a day, those who shed more than the average count can do something about this. By applying sweet almond hair directly on the scalp, you will strengthen hair follicles, reduce hair loss, and improve scalp condition. 4. Promotes healing of scars - Scars from acne and other wounds heal quicker when sweet almond oil is applied. 5. Relieves other skin problems - The appearance of stretch marks and uneven spots on the face is reduced because sweet almond oil helps in balancing moisture levels of the skin. Sweet almond oil is not only touted for its enriching effect on the skin and hair. Studies and researches also show that sweet almond oil can have therapeutic effects such as healing the skin, reducing itchiness for those suffering from psoriasis and eczema, and even protection from sun damage. The oil is rich in vitamins and has antioxidant properties. So, the next time you are replenishing your beauty supplies, try sweet almond oil and see those amazing changes on your skin.